Many valuable biopharmaceutical and biotechnological proteins have been produced in Escherichia coli, however these proteins are almost exclusively localised in the cytoplasm or periplasm. This presents challenges for purification, i.e. the removal of contaminating cellular constituents. One solution is secretion directly into the surrounding media, which we achieved via the ‘hijack’ of the flagellar type III secretion system (FT3SS). Ordinarily flagellar subunits are exported through the centre of the growing flagellum, before assembly at the tip. However, we exploit the fact that in the absence of certain flagellar components (e.g. cap proteins), monomeric flagellar proteins are secreted into the supernatant. We report the creation and iterative improvement of an E. coli strain, by means of a modified FT3SS and a modular plasmid system, for secretion of exemplar proteins. We show that removal of the flagellin and HAP proteins (FliC and FlgKL) resulted in an optimal prototype. 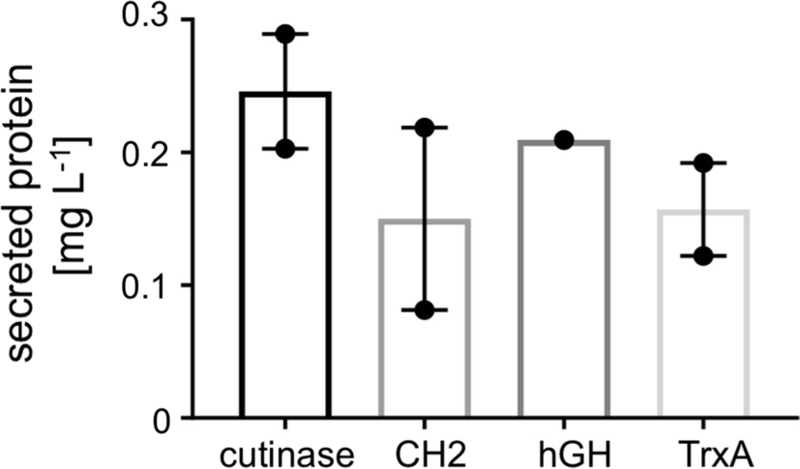 We next developed a high-throughput enzymatic secretion assay based on cutinase. This indicated that removal of the flagellar motor proteins, motAB (to reduce metabolic burden) and protein degradation machinery, clpX (to boost FT3SS levels intracellularly), result in high capacity secretion. We also show that a secretion construct comprising the 5′UTR and first 47 amino acidsof FliC from E. coli (but no 3′UTR) achieved the highest levels of secretion. Upon combination, we show a 24-fold improvement in secretion of a heterologous (cutinase) enzyme over the original strain. This improved strain could export a range of pharmaceutically relevant heterologous proteins [hGH, TrxA, ScFv (CH2)], achieving secreted yields of up to 0.29 mg L−1, in low cell density culture. We have engineered an E. coli which secretes a range of recombinant proteins, through the FT3SS, to the extracellular media. With further developments, including cell culture process strategies, we envision further improvement to the secreted titre of recombinant protein, with the potential application for protein production for biotechnological purposes. A persistent goal of biotechnology is to produce recombinant protein at reduced cost, while maintaining high product quality and yield. For many protein biologics, production in prokaryotes (chiefly in E. coli) is favoured. Major advantages include fast growth to high cell densities on cheap carbon sources, and simple scale up [1, 2]. However, as in many industrial biotechnology (IB) processes, downstream processing accounts for a high proportion of costs [3–5]. If protein product was secreted by the expression organism into the growth media, these costs could be reduced, as purification could be simplified, i.e. eliminating the need to lyse cells, or to remove cellular contaminants, which can compromise product purity, and may elicit an immune response in humans (e.g. lipopolysaccharide in E. coli) [6–8]. In addition, product yield and quality may be increased, as secretion would bypass cytoplasmic and periplasmic proteases. Extracellular secretion may also improve protein folding and solubility, while also reducing the formation of inclusion bodies, thus increasing product yield and quality [9–12]. Secretion of heterologous protein in E. coli has been utilised, however the majority of work concerns secretion into the periplasm via Sec or Tat-dependent systems . While this strategy can yield titres in the mg L−1 range (e.g. 30 mg L−1 human growth hormone , 60 mg L−1 GFP ), this is only achieved following purification from the periplasm. Alternatively extracellular localisation of protein can be achieved In E. coli without directed secretion to the extracellular space via strategies that make use of ‘leaky strains’ , where heterologous proteins are fused to a secretion tag (for example ompA, ompC, pelB [16, 17]), to enable directed secretion to the periplasm, followed by leaking into the supernatant. While titres may be favourable, the presence of additional periplasmic proteins adds complexity to purification, e.g. while 550 mg L−1 cell culture of lipase B tagged with the pelB signal sequence was found in the extracellular fraction of E. coli, high concentrations of periplasmic proteins were also detected, and only one-fifth of the product was able to be recovered . To date, true secretion (i.e. to the extracellular space via a defined secretion system, rather than through leaking or lysis) of heterologous protein by prokaryotes has been achieved at up to approximately 50 mg L−1, in organisms such as Bacillus and Pseudomonas [19–21], as opposed to the g L−1 titres achieved in eukaryotes such as Pichia pastoris . In E. coli, attempts to secrete proteins directly into the media have been limited, with evidence of low levels (i.e. 1 µg to 1 mg L−1 of heterologous protein) via type I secretion system (T1SS) using either the Haemolysin or lipase transporting ABC transporter systems [23–28]. Another option for direct secretion into the media, is the bacterial flagellar type III secretion system, which has been utilised in E. coli [29–32], Bacillus  and Salmonella enterica sv. Typhimurium [33–36]. In addition, secretion of up to 30 mg L−1 of a range of polymers , such as tropo-elastin and spider silk, have also been reported using the injectisome type III secretion system of S. enterica [37–39]. In this report we focus on the E. coli FT3SS, due to a preference in IB for both E. coli, and non-pathogenicity associated secretion systems. E. coli have 4–10 flagellum of around 20 μm in length, each comprising of up to 30,000 flagellin (FliC) monomers [40–43]. The FT3SS, despite having evolved to build a flagellum and provide motility to the cell, is effectively an efficient protein secretion machineable to assemble a multi-component structure composed of several thousand subunits on its surface. Proteins initially assemble at the inner membrane, resulting in a pore of about 2.0 nm diameter, through which the majority of the remaining flagellar proteins are exported, unfolded, to the distal end of the existing flagellar structure . Therefore in the context of biotechnology, the FT3SS may provide a one step, high capacity route for protein export. The basic flagellar structure is comprised of the basal body (motor and secretion apparatus), hook (universal joint), and filament (propeller), which are assembled in an ordered manner, controlled by well-understood checkpoints . One key feature is the existence of a flagella master regulator (FlhD4C2-class I) that activates class II flagellar genes. These class II genes transcribe the basal body and FT3SS apparatus, along with the sigma factor FliA, which in turn promotes the transcription of the class III genes (for the filament, motor, hook associated and hook proteins, along with the chaperone and chemotaxis proteins) [46, 47]. Furthermore, transcription is also coupled to assembly, as levels of FliA are modulated by the anti-sigma factor (FlgM), which is secreted upon hook-completion [48–50]. Additionally, given the energetic cost of motility, expression of the master regulator is modulated by many environmental cues that alter gene expression of the flhDC operon or activity of FlhD4C2 [51, 52]. Here, we aimed to capitalise on the fact that upon mechanical shearing or breakage, flagellar continue to secrete unfolded FliC monomers which are transported to the distal growing tip, allowing regrowth under the FliD cap [53–55]. In addition, in the absence of the FliD cap, or other structural proteins (e.g. FlgKL), secretion of FliC monomers into the media without polymerisation occurs [56, 57]. In addition, the N-terminal secretion signals of FT3SS subunits are well characterised and have been exploited to direct non-FT3SS subunits for secretion through the FT3SS in E. coli [29–32] and (their close relatives) Salmonella [34–36]. We aimed to develop an improved, modular FT3SS E. coli strain for high yielding secretion of a range of therapeutic recombinant proteins. Our eventual aim is to surpass the secretion titres reported in other E. coli secretion systems, by achieving extracellular secreted titres in the high mg L−1 range. We hope to accomplish this using controlled secretion to the extracellular space, combined with the absence of cellular contaminants. Here we report progress towards these targets via strain development, secretion signal optimisation, rigorous use of controls, and development of a high-throughput assay to measure FT3SS secretion. In this study we used E. coli MC1000 as the parent strain, partly for biosafety given its leucine auxotrophy, but also given the presence of an IS5 insertion sequence upstream of flhD. This reduces negative transcriptional regulation on flhDC, by disrupting promoter binding sites for the negative regulators LrhA and OmpR (for annotated sequence see Additional file 1: Fig. S1) [58–60]. Previous studies of FT3SS dependent protein secretion in E. coli employed a ΔfliD ‘cap-less’ strain [29–31, 36]. We also considered alternative strategies, given the potential for this strain to influence and suppress FlhD4C2 activity via post-translational protein–protein interactions of the FlhDC complex with FliT (the chaperone of FliD) [61, 62]. Specifically, we created a ‘HAP-less’ (ΔflgKL) strain, which would not incur feedback on FlhD4C2−, but would theoretically decouple secretion from assembly, i.e. as opposed to the ΔfliD strain where more free FliT would potentially repress FlhD4C2 activity, and thus flagellar gene expression . In addition, it has also been established that in ΔflgKL mutants, unpolymerised FliC monomers are secreted into the media, rather than assembling into a filament . To lessen competitive secretion, strains also lacked fliC. We found that the HAP-less and cap-less strains displayed identical growth curve parameters (Additional file 1: Fig. S2). We then compared their ability to export a 39 kDa shortened version of FliC that lacked the central D3 domain (residues 191–283) so that it could be easily distinguished from native FliC. This secretion substrate was termed FliC-ΔD3 and was inserted into plasmid pTrc99a-FF to create pTrc-FliC-ΔD3, and expressed by addition of IPTG. This substrate was efficiently secreted (Fig. 1) and also produced a fully motile strain when provided in trans in a ΔfliC strain (Additional file 1: Fig. S3). As shown in Fig. 1a, b when FliC-ΔD3 was expressed with induction using 0.05 mM IPTG, we observed approximately twofold more FliC-ΔD3 (on average 7.4 mg L−1) in the secreted fraction of the HAP-less strain in comparison to the cap-less. Notably, we also observed increased amounts of FliC intracellularly in the HAP-less strain (Fig. 1a, c) but found overall that the HAP-less strain was 1.3 times more efficient at secreting protein (secreted FliC-ΔD3 as a function of total FliC-ΔD3, i.e. 7.4 mg L−1 divided by 98 mg L−1 for the HAP-less strain). 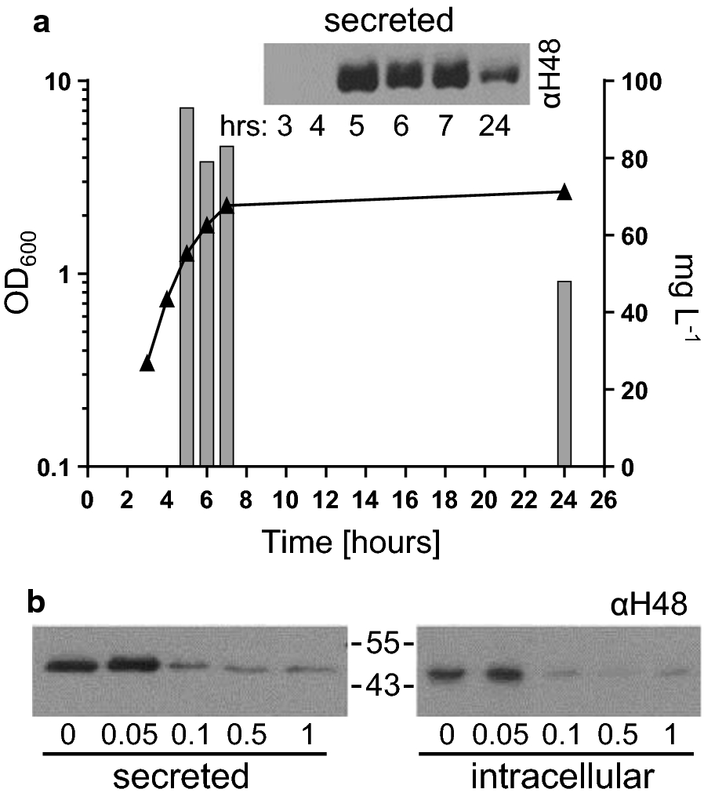 Based on the absence of additional proteins in the cell supernatant (Fig. 1a—Coomassie), we infer that the improved titre of secreted FliC-ΔD3 was due to FT3SS secretion, as cell lysis was not prevalent in either of these strains. We therefore used the HAP-less, ΔfliC ΔflgKL strain in subsequent experiments as our prototype FT3SS secretion strain. Before further experimentation, we defined optimal parameters for expression and production of proteins via the FT3SS-assessing that the optimal OD600 for harvest of cells for maximal secretion of FliC-ΔD3, is between an OD600 of 1 and 2, i.e. the mid-late exponential phase (Fig. 2a and inset). We then examined the effects of varying the inducer (IPTG) concentration on expression and secretion of FliC-ΔD3. We harvested cells at an OD600 of 1.0 and show that 0.05 mM IPTG produced the highest concentration of both intracellular and secreted FliC-ΔD3 (Fig. 2b), therefore this procedure forms the basis of experiments. To establish whether secretion via the FT3SS could be improved from this basal level, we considered a series of mutations that might boost overall flagellar gene expression. We then compared their effect on secretion to a number of negative controls, to establish the absolute specificity of this system. As seen in Fig. 3a, b, use of an flhDC null mutant, with no FT3SS present, resulted in complete lack of FliC-ΔD3 secretion even when overproduced in the cytoplasm (by addition of 1 mM IPTG). In parallel we also tested secretion of FliC-ΔD3 in a (ΔfliC ΔflgKL) ∆flgDE strain, in which secretion of ‘late’ filament substrates (i.e. FliC) is abrogated due to the absence of substrate specificity switching [57, 63], and observed a complete lack of secretion in this strain. Further to these controls, we also tested for the presence of the strictly cytoplasmic, GroEL chaperonin protein. Aside from a negligible amount in the ∆flhDC strain, the cytoplasmic contaminant GroEL was absent in secreted fractions (Fig. 3c). This demonstrates that cell lysis was not prevalent, and that the two secretion strains are no more ‘leaky’ that the negative control strains. Together, this confirmed that the presence of FliC-ΔD3 monomers in the secreted fraction was due to targeted FT3SS secretion alone. We then examined the effect of mutations that might upregulate flagellar gene expression. Our initial target was the protein quality control protein, ClpX, a component of the ClpXP protease complex which acts on FlhD4C2 . In previous studies the removal of clpX in Salmonella and enterohaemorrhagic E. coli resulted in an accumulation of FlhD4C2, an increase in the amount of FliC subunits secreted, and increased cell motility [65–67]. Here we show that the removal of clpX from wildtype E. coli MC1000 cells resulted in an increase in filament proteins and increased motility (Additional file 1: Fig. S4a–d). The removal of clpX from the prototype strain resulted in an increase in both intracellular and secreted FliC-ΔD3 (Fig. 3a, b). The secretion efficiency (secreted protein as a proportion of the total (intracellular and secreted) protein) did not alter, however we did measure a 1.6-fold average increase in the titre of secreted protein, and a maximum estimated secretion of 34 mg FliC-ΔD3 L−1 culture medium achieved from ΔfliC ΔflgKL ∆clpX (calculated by comparison to a FliC-ΔD3 standard). We also noted that ΔfliC ΔflgKL ΔclpX cells were on average 1.2 times longer (p < 0.001. t-test) than ΔfliC ΔflgKL cells, with a higher abundance of very long cells (> 0.8 µm) (Additional file 1: Fig. S4e–g). As we detected significantly more (p < 0.05) FlhA in ΔclpX cells (Fig. 5c), this may suggest that elongated cells harbour a larger number of FT3SS basal bodies, thus allowing increased secretion, though we have no experimental evidence for this at this stage. Of note is that we also produced a ΔfliC ΔflgKL ΔdksA strain, which in contrast to what was anticipated based on published literature [68, 69], did not result in any noticeable increases in FT3SS secretion. As a result, we moved on with the ΔfliC ΔflgKL ∆clpX strain as a Mark II FT3SS strain to test additional strain modifications. In order to move towards our goal of production and secretion of heterologous proteins via the FT3SS, we designed and tested a synthetic prototype modular vector. This contained elements aimed at optimal secretion of proteins via the FT3SS, alongside their subsequent detection and ultimately purification (FLAG and Streptavidin, TEV protease. See Additional file 1: Fig. S5). These were produced as plasmids in the IP-Free pJEXpress backbone (DNA2.0), with the first 47 amino acids of FliC (the secretion signal ), the fliC 5′UTR (which also harbours the native fliC promoter, thus allowing both T5 based-IPTG inducible, and flagellar mediated (class III, via FliA [71, 72]) gene expression), alongside the fliC 3′UTR, both of which have been implicated in influencing secretion through the FT3SS [30, 31]. Finally, restriction enzyme sites were incorporated throughout to allow modular modification of the secretion construct; notably EcoRI and PstI sites allow for the insertion of any cargo gene for secretion. We initially chose a heterologous protein target for secretion which was non-bacterial, commercially relevant and assayable. This enabled ease of screening for secretion via an activity assay, thus facilitating higher throughput screening for improved FT3SS strains. Our choice was the well-characterised 20.8 kDa cutinase from the unicellular fungus Fusarium solani, which had previously been expressed in E. coli intracellularly [73, 74], and for which a well-established activity assay based on its esterase activity is known . Advantageously, cutinase is also relevant in IB processes, e.g. degradation of plastics [76, 77]. An E. coli codon optimised cutinase was synthesised (GeneArt®) and inserted into the pJex-fliC47-empty plasmid resulting in pJex-fliC47-cutinase, which is predicted to yield a 30.6 kDa peptide. Following expression of pJex-fliC47-cutinase in the ∆fliC ∆flgKL strain, both intracellular and secreted cutinase were detected, via the secretion construct incorporated FLAG tag (Fig. 4a). We next developed a simple fluorimetric secretion assay, based on cleavage of 4-methylumbelliferyl butyrate (MUB) by cutinase to yield a fluorescent 4-methylumbelliferone (4-MU) . Cell-free supernatant was mixed with MUB in the presence of an appropriate buffer, and release of 4-MU was measured. This could be qualitatively observed on a UV-transilluminator to allow quick visual screening (Fig. 4b). We also established conditions for a quantitative plate-reader based version of the assay (excitation 302 nm, emission 446 nm). To test the specificity of the assay, pJex-fliC47-cutinase was transformed into negative control strains (∆flhDC and ΔfliC ΔflgKL ∆flgDE) as in Fig. 3. After subtraction of background MUB cleavage no activity was detected in strains containing pJex-fliC47-empty or LB only controls (Fig. 4c). Absence of secretion was verified by immunoblotting of the same samples (Fig. 4d). Reassuringly, we observed increased concentrations of secreted cutinase (twofold higher AU) in the Mark II ΔfliC ΔflgKL ΔclpX strain compared to the ΔfliC ΔflgKL prototype strain. We used this assay to detect a range of concentrations of secreted cutinase (0.04–0.20 mg L−1), and note that the assay could detect cutinase concentrations is excess of this. With the assay established, it was possible to screen a larger number of strains and secretion signal variants, with the aim of generating a higher capacity, Mark III secretion strain. The MUB-cutinase assay was next utilised to assess the secretion capacity of a number of alternative FT3SS secretion strains. These were engineered to upregulate flagellar expression, or reduce metabolic burden via the deletion of redundant genes. These included the clpX knockout strain outlined previously, and three additional targets: ∆flgMN (FlgM a negative regulator of class III flagellar gene regulation, and FlgN chaperone for FlgK and regulator of FlgM [50, 79, 80]), ∆fliDST (FliT—an anti-FlhD4C2 factor and FliST—chaperones of FliCD [61, 81]) and ∆motAB (MotAB responsible for energising flagellar rotation, but not required for secretion [82, 83]). Following their construction and establishing that growth of all strains was comparable to ∆fliC ∆flgKL (Additional file 1: Fig. S6), the supernatant was analysed for the presence of cutinase via the MUB fluorescence assay (Fig. 5a). Of all the combinations tested, only ∆fliC ∆flgKL ∆motAB ∆fliDST and ∆fliC ∆flgKL ∆clpX ∆motAB resulted in a significant improvement to secretion, in comparison to the original ∆fliC ∆flgKL strain: 1.64- and 1.67-fold respectively, (p < 0.05 and < 0.01). To ensure that poor secretion was not a factor of poor cutinase expression, the presence of intracellular cutinase in all strains was confirmed with immunoblotting (Fig. 5a—intracellular). Having identified high capacity secretion strains that could secrete active fungal cutinase, we now wished to test a human recombinant protein: an E. coli codon optimised version of the gene encoding human ‘CH2’ (CH2) ScFv antibody fragment (23 kDa, donated by J. Pandhal, University of Sheffield [84, 85]), which is used as an adjuvant in human antibody drugs. This was inserted into our modular secretion vector. We compared secretion of CH2 and the native substrate, FliC-ΔD3, in the most promising secretion strains, and observed (similarly to cutinase) improved secretion in ΔfliC ΔflgKL ∆clpX ∆motAB strain: 2.57× (CH2) and 3.75× (FliC-ΔD3) over that observed for the prototype strain (Fig. 5b). For both substrates this amounted to a 2.8-fold improvement to secretion efficiency. In contrast, the ΔfliC ΔflgKL ∆motAB ∆fliDST strain did not perform in a similar manner to cutinase, when secreting CH2 and FliC-ΔD3, with no improvement to secretion over the prototype. We thus concentrated on ΔfliC ΔflgKL ∆clpX ∆motAB, as a Mark III strain. To gain more information on the varying success of these two strains, we used an antibody directed against the FlhA protein (which is present as part of the FT3SS export apparatus) as a proxy indicator of the number of flagellar export apparatus in the cell population. Since its gene expression is under the control of FlhD4C2, FlhA is also an indicator of total flagellar gene expression. Whole cell lysates were examined by immunoblot and quantified by densitometry analysis (Fig. 5c). Mutant strains representing the individual knockout strategies were also included as controls. Overall, these data indicate that deletion of clpX results in an increase in FlhA levels by approximately 1.5-fold in both the ΔfliC ΔflgKL and ΔfliC ΔflgKL ΔmotAB backgrounds (p < 0.05). In contrast, deletion of motAB alone seems to reduce FlhA levels (0.75-fold; p < 0.01). Overall, it is evident that the absence of clpX in strains upregulates FlhA levels, and by extension, other class II and III genes, which may explain the improvements to secretion we observed. In parallel to the studies aimed at strain engineering for increased FT3SS capacity, we also examined the influence of the secretion signal employed in the plasmid-based modular secretion vector. The reasoning here was that the literature reports that the inclusion of the first 47 residues of FliC , the 5′ and 3′UTRs [29, 30, 35], or a truncated FliC 26–47 construct with either the Salmonella or E. coli version of residues 26–28 [34, 35], can direct export of protein through a truncated FT3SS. All secretion construct (denoted SC) variants were inserted in frame with the cutinase gene, with the predicted size in kDa shown (Fig. 6). These studies were conducted using the prototype ∆fliC ∆flgKL strain, with a ∆flhDC strain and empty vector as negative controls. Expression of the prototype secretion construct (labelled as SC0 here) in the Mark II ∆fliC ∆flgKL ∆clpX strain served as an additional positive comparator. The data show that while all constructs produced cutinase (Fig. 7a), some constructs neither expressed nor secreted well (SC3, 5, 7), while others had low intracellular but significantly higher secreted levels of cutinase (SC1, p < 0.005), or, significantly high intracellular cutinase (p < 0.001) with none secreted (SC8) (see Fig. 7b). From these data it is possible to infer that the 3′UTR—while putatively influencing intracellular stability of cutinase-seems to actually reduce export (SC3, 5, 7). Whereas the intact 5′UTR and FliC 1–47 alone (SC1) seem to permit the highest levels of secretion, as this exports cutinase at 1.8-fold higher concentrations than the prototype (SC0). This led us to examine the possibility that the FliC 5′UTR alone, has the ability to direct secretion-as has been indicated by other workers . However, when we inserted the cutinase gene into plasmids containing only the 5 and 3′UTRs (SC10) or the 5′UTR alone (SC11), we observed that despite good expression in all strains (Additional file 1: Fig. S7), cutinase secretion was at least fourfold lower (Fig. 7c). With this evidence, the plasmid harbouring SC1 was taken forward (for the construction of a Mark IV secretion strain) as the best candidate for increased secretion through the FT3SS. As a final step to investigate the optimal secretion signal, we compared secretion of our ‘late’ FliC signal with early flagellar substrate signal sequences, namely the hook (FlgE) and hook-cap (FlgD) proteins. In order to compare these signals, we constructed cutinase harbouring secretion signal sequence variants using the first 100 amino acids of FlgD or FlgE (Additional file 1: Fig. S8a) for testing in both an early-locked, hook-less [ΔfliC ΔflgKL ∆flgDE (∆clpX)], and a substrate switched [ΔfliC ΔflgKL (ΔclpX)] background. The FlgE signal did not permit secretion in either strain, and the FlgD signal was four- to fivefold less effective at export than the FliC signal (Additional file 1: Fig. S8b). This indicated that despite the streamlined nature of the hook-less strain, it is in fact less efficient for secretion than the HAP-less strain. We did observe low-levels of cutinase secretion with SC13 (FlgD signal) in the ΔfliC ΔflgKL ΔclpX strain, presumably due to higher expression of secretion apparatus, but still at a much lower level (fourfold) than with the intact FliC signal (SC1). Finally combination of the improvements to the chassis and modular secretion vector were investigated in comparison to the prototype versions. Both strains contained more intracellular cutinase following expression of SC1 over the SC0 prototype (Fig. 8a). Additionally there was more intracellular cutinase in the Mark III strain than the prototype-irrespective of secretion construct. Detection of the FLAG-tag by immunoblotting allowed visualisation of secreted cutinase by a means other than the MUB assay. In agreement with previous results (Fig. 5a, b), the Mark III strain secreted a higher concentration of substrate in comparison to the ΔfliC ΔflgKL strain when expressing the prototype secretion construct (Fig. 8b, d), this translated to a 3.83-fold improvement in secretion efficiency (Fig. 8a, b). However, the highest concentrations of secreted cutinase were seen when either strain expressed SC1, with ΔfliC ΔflgKL ΔclpX ΔmotAB resulting in the highest. Given the low abundance of GroEL in ΔfliC ΔflgKL ΔclpX ΔmotAB cell supernatant (Fig. 8c), we show that the increase in extracellular cutinase in this modified strain is not due to cell lysis or membrane leakage. In fact the lower level of cytoplasmic leakage in ΔfliC ΔflgKL ΔclpX ΔmotAB suggests that the clpX allele may in fact destabilise the cell envelope, although this would require further investigation. 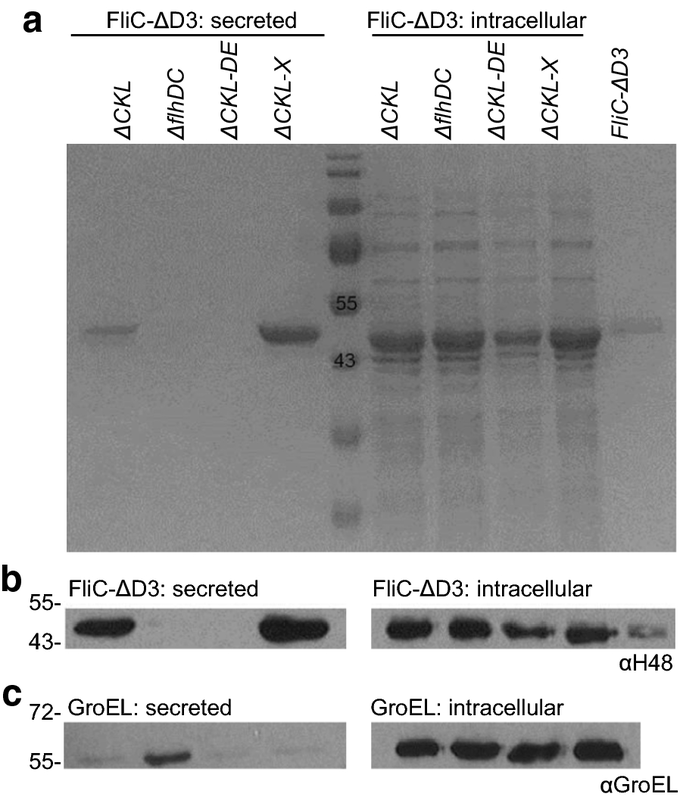 We also note that the α-GroEL antibody is very sensitive and the Coomassie stained gel (not shown) did not indicate cell leakage in the ΔfliC ΔflgKL strain either. Using the same samples, a MUB protein secretion assay was carried out (Fig. 8e). The improvement attributed to the optimised strain (ΔfliC ΔflgKL ΔclpX ΔmotAB) was 7.68-fold, and for the secretion construct (SC1) 15.70. Upon combination (Mark IV strain) these improvements were additive, resulting in a 23.78-fold increase in fluorescence in comparison to the prototypes (all p < 0.001). 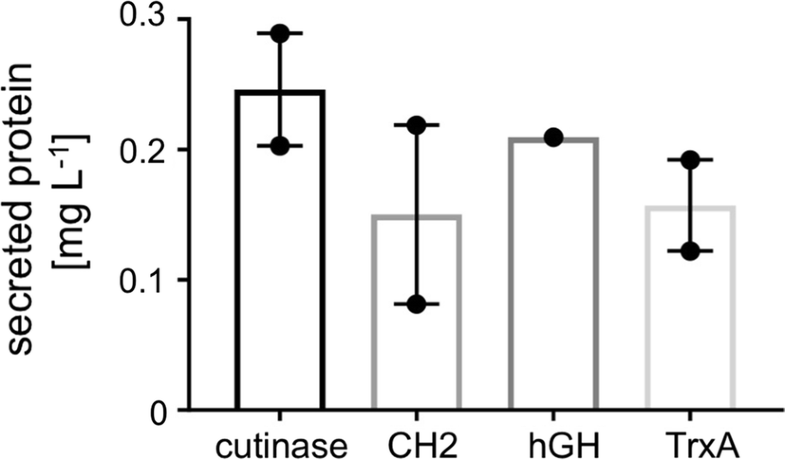 Densitometry analysis of secreted cutinase measured by immunoblotting (Fig. 8a, b), showed that the strain was 5.64 times more efficient at secreting cutinase than the prototype. Despite immunoblotting determining the combined fold change in the Mark IV strain to be less pronounced (Fig. 8d), the overall trend is consistent with the MUB fluorescence assay (Fig. 8e). The Mark IV strain had an average titre of 0.16 mg L−1 secreted cutinase (highest 0.19 mg L−1) (Fig. 9). Finally we investigated secretion of a number of pharmaceutically relevant, human proteins in the Mark IV FT3SS strain. These included E. coli codon optimised versions of, the aforementioned CH2 ScFv fragment, and also human growth hormone (hGH) and thioredoxin (TrxA)—both of which were kindly gifted following an ongoing collaboration with FUJIFILM Diosynth Biotechnologies, UK. Genes were PCR amplified with EcoRI and PstI restriction site ends and inserted into the SC1 harbouring plasmid. All were secreted into the media, with respective average titres of 0.25, 0.15 and 0.21 mg L−1 from an OD600 1.0 culture (Fig. 9, Additional file 1: Fig. S9). Despite the clear benefits to protein production, to date, true secretion of recombinant protein by bacterial expression systems into the media is only possible in the mg L−1 cell culture range, even in high density culture [19–21]. For commercial use this requires improvement, especially when compared to eukaryotic expression organisms—such as Pichia which can reach 15 g L−1 . We focus on an E. coli chassis, due to its preferential use in IB, for a host of beneficial reasons. In this study, we set out to engineer an E. coli with the ability to secrete recombinant protein into the extracellular media, in one direct step. A clear candidate for this was the one step FT3SS, and while recombinant protein has been secreted through the FT3SS previously [29–31, 34, 36], we aimed to make improvements to improve secretion capacity, without leakage, though strain engineering and design of a modular secretion and purification system. We established that a prototype ∆fliC ∆flgKL strain outperformed a ∆fliCD strain (as utilised in other studies [29–31], in both protein production and secretion (Fig. 1). One explanation might be that FliD binds FliT, and so in the FliCD strain, more FliT is free to interact with, and suppress FlhD4C2 activity, thus reducing FT3SS expression and secretion . In contrast removal of FlgKL frees up the chaperone FlgN to promote translation-coupled secretion of FlgM-further raising expression of FT3SS components (including the fliC-UTR harbouring modular secretion construct) , but whether this occurs in E. coli is not clear at present. We next investigated whether strain engineering could improve secretion, and found that removal of clpX (a component of the ClpXP protease complex), which is known to actively bind to, and degrade FlhD4C2 , improved the yield of secreted FliC by 1.6-fold, to 34 mg FliC-ΔD3 L−1 culture medium at OD600 1.0 (Fig. 3). This became our Mark II strain. We also show total absence of FliC-ΔD3 in the secreted fractions of FT3SS null strains, along with very low abundance of cytoplasmic contamination (absence of GroEL) (Fig. 3). This observation is consistent for recombinant proteins (Fig. 4d). Furthermore we show that, in the absence of the FliC secretion signal peptide, protein is not exported (Fig. 7b, c and Additional file 1: Fig. S7). Combined, this demonstrates that in our system, the truncated FT3SS shows excellent selectivity and that leakage is not prevalent. Development of a high-throughput, enzyme based, secretion assay (Fig. 4) enabled us to screen a range of engineered strains and secretion signal constructs (Figs. 5, 7). As enzyme activity requires correct protein folding, the assay also highlights that secreted heterologous cutinase correctly folds in the extracellular media, thus allowing functionality. This is very attractive when considering the proposed biotechnological applications of this truncated FT3SS secretion platform. Through this screen we established the ∆flgKL ∆fliC ∆clpX ∆motAB as the superior (Mark III) secretion strain (Fig. 5). Several lines of evidence supported that clpX deletion has a positive effect on secretion through the FT3SS [64–67]. Further to this, we observed increased filament production and motility in ΔclpX cells in a wild-type background (Additional file 1: Fig. S4), suggesting increased flagellar gene expression. We confirmed this notion in our truncated secretor strain, as more FlhA was detected in ΔclpX mutants (Fig. 5c), suggesting an increase in the number of basal bodies (secretion apparatus). In contrast, the concentration of FlhA was not increased in motAB mutants, indicating that improved secretion in these strains was not due to higher abundance of secretion apparatus. A probable explanation is that this strain has reduced drain on the proton motive force [82, 83], which would usually provide energy to drive flagellar rotation [86, 87], but also has implications for secretion and growth. We also established, surprisingly, that combining the fliDST mutation with the Mark III ∆flgKL ∆fliC ∆clpX ∆motAB strain increased secretion of cutinase, but not other proteins (Fig. 5b), indicating that there may be some protein specific factors in determining secretion capacity. In fact the removal of fliDST, or flgMN were generally not beneficial to secretion. This may be attributed to the fact that there are contrasting reports on the effect of FlgM(N) deletion on flagellar expression in the literature [50, 79]. This is complicated by the fact that, FliS also binds FlgM prior to fliA expression, suppressing secretion of FlgM upon hook-basal body completion , while removal of FliDST per se has been shown to result in an increase in secreted FlgM . In addition, FlgN is also implicated here, as a positive regulator of FlgM translation , further complicating this picture, and making these data both hard to predict and interpret. We show that a construct containing the 5′UTR and FliC1–47 secretion signal (SC1) was the most efficient for secretion of recombinant proteins (Fig. 7b). In agreement with previous work [30, 33], we did not find inclusion of the 3′UTR to be necessary for secretion—as an extension to this, we also show that exclusion of the 3′UTR dramatically increases secretion, despite potentially reducing internal levels (Fig. 7a). An explanation may be linked to the evidence that the 3′UTR influences levels and stability of the fliC mRNA , which in turn has been shown to reduce FlgM secretion . If this is affected by the 3′UTR region specifically, then this could explain improved secretion in the absence of the 3′UTR, as FlgM might be more readily secreted from the FT3SS—however at this time we have no evidence to support this theory. In contrast, the 5′UTR and FliC1–47 are able to both direct secretion and ensure adequate protein expression. One reason for this might be that the signal peptide confers some level of solubility or reduces formation of inclusion bodies—though again we have not tested this directly. Notably, our evidence (Fig. 7b, Additional file 1: Fig. S7) does not match that of other reports where the FliC 5′UTR [30, 31], or 26–47 residues of the FliC signal alone [34, 35], direct efficient secretion in E. coli. Neither does it match evidence that the 5′UTR is not necessary for secretion , and we can only attribute these differences to potential variances in strain background or experimental conditions. It would seem that modification of the secretion signal had a larger effect on secretion capacity than the strain improvements (15.70- and 7.68-fold improvements respectively). Most compelling, was our finding that upon combination, these improvements have an additive effect on the secretion capacity of the FT3SS (Fig. 8). The overall 23.78-fold improvement to cutinase secretion through the FT3SS is a step-forward in terms of moving towards an E. coli strain capable of high capacity secretion of recombinant protein into the extracellular media, in one step. In our lab, the best secreted yield of protein achieved (with cell density OD600 < 1.5) in our truncated FT3SS (maximum of 240 mg L−1, average 80–90 mg L−1, of FliC-ΔDE3 secreted into the extracellular media), surpasses that reported for alternative E. coli systems, which also enable secretion into the media. For example in the T1SS: typically in the µg L−1 range, but up to 3 mg−1 OD unit cell culture at high cell density [23–28, 91] and FT3SS (ΔfliCD): up to 12 mg L−1 (although under unspecified high density cell culture conditions, ). We also exceed reported yields achieved for secretion into the E. coli periplasm by the type II secretion system at low cell density (30–60 mg L−1 [13, 14]), without the requirement for periplasmic extraction or the risk of proteolytic enzymes compromising protein quality. However as we are proposing the use of our strain as a secretion platform in a biotechnological context, we finally set out to investigate the performance of the Mark IV strain when secreting a broad range of industrial and pharmaceutically relevant recombinant proteins. At low cell density (OD600 1.0) we achieved average yields of 0.16, 0.25, 0.15 and 0.21 mg L−1 for cutinase, a CH2 ScFv fragment, human growth hormone and thioredoxin respectively (Fig. 9). The secreted titres we report for heterologous protein are lower than those which we measure for native protein (FliC-ΔDE3). This was anticipated, as aside from a small truncation, FliC-ΔDE3 is a natural substrate of the FT3SS, whereas the heterologous proteins are non-native to both the organism and the secretion system. We acknowledge that our titres of heterologous protein are lower compared to other bacterial systems (where up to 50 mg L−1 was achieved) [20, 21]. However our results are still compelling, given that (unlike the majority of literature examples) we have achieved these titres from (1) culture supernatant, (2) at low cell density in E. coli, and (3) showed excellent control of secretion to the extracellular space, with no evidence for cell leakage. When comparing our final Mark IV strain to other strains that meet the majority of these credentials, our current strain secretes around four times less heterologous protein than the best titre reported in the T1SS (cell density unclear) , and around 50 times less than an alternative FT3SS system (carried out at a higher cell density and with different proteins) . To match these reported titres in the future, we aim to further boost the titres of secreted protein, with a modified cell culture strategy and more strain engineering. For example, while our supernatant was harvested at a maximum cell density of OD600 1.5; it is noted that transfer to high cell density culture (OD600 > 180) can greatly improve yields . Indeed we have begun to test these strains at higher cell density in bioreactors with no obvious growth defects (unpublished data). Finally, the modular secretion vector has not only been optimised to enable high levels of expression (with the removal of the 3′UTR), and flexibility of protein cargo, but also serves as a versatile platform technology which could be easily adapted for specific applications, i.e. by exchanging the purification or antigen tags. We are currently focussing on how the modular secretion vector performs in terms of recovery of purified protein, free of the accessory tags. We have used a combinatorial approach, incorporating strain design and a genetic modular secretion vector, to achieve improved extracellular titres, of a range of biotechnologically relevant protein products, by secretion through a truncated E. coli FT3SS. This may enable simplified downstream processing of higher quality product, free of cellular contaminants, all of which are of great interest to the biopharmaceutical and IB communities. Furthermore, this opens up the possibility of cell cultures that secrete protein continuously, without the need to sacrifice cell culture to retrieve protein product. During development of the truncated secretion construct, a number of findings provided new information on the roles of the secretion signal peptide and UTRs of FliC monomers. We also introduce a high-throughput assay, enabling quick and accurate measurement of the secretion output of truncated FT3SS strains. We are currently using this in inverse genetic engineering approaches to identify factors that might boost secretion further. We suggest that the body of this work serves as a pilot feasibility study, and are working on further improvements (high cell density culture, purifying recombinant protein from the media), with which we envision that our FT3SS secretion platform could become a forerunner for use in the production of biopharmaceuticals and IB products. E. coli MC1000 was used for the construction of all mutants in this work (Additional file 1: Table S1). E. coli strain MG1655 clpX::Tn5(KmR) was kindly gifted by J. Green, University of Sheffield and was used as a donor for transduction in the construction of clpX strains. Strains were grown in LB broth or on LB agar plates, supplemented with ampicillin (100 µg mL−1), chloramphenicol (25 µg mL−1) or kanamycin (50 µg mL−1) or Isopropyl β-d-1-thiogalactopyranoside (IPTG) (concentration stated in figure legends) as appropriate. Prior to assaying protein secretion by SDS-PAGE or enzymatic secretion assay, fresh media was inoculated with cells from a liquid overnight culture and induced. Bacteria were grown with shaking at 180 rpm, 37 °C. Phage transduction was carried out by the method outlined by Lennox . Following strain construction, the eradication of phage from the strain was ensured by passaging on LB agar plates with 10 mM sodium citrate. Absence of phage was then confirmed by Evans Blue-Uranine assay, as outlined by Tiruvadi Krishnan et al. .
Plasmids utilised for chromosomal manipulations or for cloning are listed in Additional file 1: Table S2. High fidelity and diagnostic polymerase chain reaction (PCR) was carried out with Phusion High Fidelity polymerase (New England Biosciences) and DreamTaq DNA Polymerase (Thermo Scientific) respectively. Templates and custom primers (Sigma-Aldrich) are listed in Additional file 1: Table S3. Chromosomal modifications were carried out, as described by Datsenko and Wanner . To enable sequential mutagenesis, pCP20 was utilised to excise FRT flanked antibiotic resistance cassettes. Modifications were PCR verified, as was the maintenance of other lesions on the chromosome, if the strain underwent sequential deletions. A genetic secretion construct was designed, synthesised and then incorporated into the pJexpress-404 plasmid backbone by DNA 2.0. This plasmid is referred to as pJex-fliC47-empty (Additional file 1: Fig. S4a) and forms the base cloning vehicle here. All restriction digests and ligation reactions were performed with NEB restriction enzymes and T4 DNA ligase (New England Biosciences). Following ligation, reaction mixes were transformed into NEB 5-alpha (New England Biosciences), as described in the supplier’s instructions. The synthetic gene for Fusarium solani cutinase (accession number: K02640), was codon optimised and synthesised by GeneArt® Strings DNA Fragments (Life Technologies). hGH and TrxA gene fragments were obtained from FUJIFILM Diosynth Biotechnologies. Following cell growth for secretion, 1 OD unit of culture samples were centrifuged for 15 min (16,000g) to ensure separation of cells and supernatant. Supernatant fractions were prepared by precipitation in 10% v/v trichloroacetic acid and washing in acetone [57, 95]. Both supernatant precipitate and cell pellets were suspended in 2× SDS buffer (10 mL glycerol, 1 g SDS, 0.1 g bromophenol blue, 200 mM DTT, to a volume of 50 mL in 100 mM Tris–HCl, pH 6.8) to a final volume of 50 µL and 200 µL respectively. Both cell lysate and supernatant samples underwent SDS–polyacrylamide gel electrophoresis (SDS-PAGE). Gels were either stained with InstantBlue™ (Expedeon) or prepared for Western immunoblotting by electro-transfer onto nitrocellulose membrane (GE Healthcare Life Science) and blocked in 3% w/v bovine serum albumin in TBS (24 g L−1 Tris base, 88 g L−1 NaCl plus 0.1% v/v Tween). The following primary antibodies were diluted 1 in 1000 in TBS/Tween: H48 monospecific H rabbit antiserum (Statens Serum Institut), monoclonal ANTI-FLAG®M2 antibody produced in mouse (Sigma-Aldrich), E. coli GroEL rabbit IgG (Sigma-Aldrich). If required, following washing and re-blocking, anti-rabbit HRP (Cell Signalling Technology) was diluted 1 in 3000. All blocking and incubation steps were carried out for 1 h. Immunoblots were visualised using Pierce® ECL Western Blotting Substrates (Thermo Scientific) and a Compact X4 X-ray Film Processor (Xograph) or C-DiGit® Chemiluminescent Western Blot Scanner (LI-COR Biosciences). Analysis by densitometry was carried out using ImageJ. For FlhA detection, the same protocol was followed except blocking was carried out in 5% w/v skimmed milk in PBS (8 g L−1 NaCl, 0.2 g L−1 KCl, 1.44 g L−1 Na2HPO4, 0.24 g L−1 KH2PO4) with 0.05% v/v Triton X100. Polyclonal anti-FlhA antisera was diluted 1 in 1000 in PBS/Triton along with E. coli ΔflhDC soluble cell lysate (to minimise non-specific binding) and following washing, membranes were incubated with a 1 in 5000 dilution of IRDye 800CW Donkey anti-rabbit secondary antibody (LI-COR Biosciences). Membranes were analysed using an Azure c500 (Azure Biosystems) imaging system and quantified with LI-COR Image Studio Lite (LI-COR Biosciences). To prepare purified monomers of truncated FliC, MC1000 ΔfliC harbouring pTrc-FliC-ΔDE3 were scraped from semisoft agar plates (1% w/v tryptone, 0.5% NaCl, 0.8% w/v bacteriological agar), following 24 h incubation at 37 °C. After resuspension in 50 mM Tris–HCl, pH 7.8, cells were agitated vigorously in a laboratory blender (Waring Laboratory Science) for 3 min, then centrifuged at 16,000 g for 5 min at 4 °C. The supernatant was then centrifuged at 67,500 g for 15 min at 4 °C. The pellet was resuspended in fresh buffer, and centrifugation repeated. In fresh buffer, the pellet underwent sonication for 20 s, followed by heating to 50 °C for 10 min to cause monomerisation. Finally, centrifugation was repeated and supernatant collected. Protein standards of CH2, TrxA and hGH were purified from the intracellular fraction of E. coli BL21 (DE3) after induction with 1 mM IPTG. Protein was purified using the secretion construct incorporated Streptavadin II tag on a 1 mL StrepTrap™ HP column (GE Healthcare Life Science) according to the manufacturer’s instructions. Following elution with 2.5 mM desthiobiotin, 100 mM Tris–HCl, 150 mM NaCl, 1 mM EDTA, pH 8, protein underwent dialysis overnight to yield purified protein in 100 mM Tris–HCl, pH 8 and quantified with a Pierce™ BCA Protein Assay Kit (Thermo Scientific). Proteins standards were aliquoted and stored at − 20 °C. An assay based on cleavage of 4-methylumbelliferyl butyrate (MUB) was developed to measure the activity of secreted cutinase. 10 mL cultures of cells expressing cutinase were induced with 0.05 mM IPTG and grown to OD600 1.0. 250 mM MUB (prepared fresh daily) was dissolved in dimethylformamide with 1% Triton X-100. This mixture was then diluted in 50 mM phosphate citrate (pH 5) buffer to a working concentration of 500 μM MUB. 40 μL supernatant was added to 96 well plate wells, the reaction was initiated with the addition of 160 μL MUB and incubated at 30 °C for 30 min. Following incubation, fluorescence was measured, either by imaging 96 well plates under UV light (G:BOX, Syngene), or using a Tecan Infinite 200 Pro plate reader-excitation 302 nm, emission 446 nm (Tecan Group Ltd.). CAG generated the majority of strains and plasmids, performed and optimised secretion experiments, including SDS-PAGE and immunoblotting, developed the cutinase secretion assay, designed experiments and interpreted data, alongside NK, EC, MH and OJB. CAG and GS lead the project design and manuscript writing. CL provided the hGH and TrxA coding sequence and insight into industrial protein production processes. PCW, GS, MH and CAG contributed to the study design and inception. All authors read and approved the final manuscript. We would like to thank J. Green and J. Pandhal for strains and the CH2 gene respectively. We thank FUJIFILM Diosynth Biotechnolgies for provision of the coding sequence of human Growth Hormone (hGH) and Thioredoxin (TrxA). CAG was funded by a University of Sheffield Ph.D. scholarship, NK by a Ph.D. scholarship from the Government of India, and EC by a BBSRC CBMNet Business Innovation voucher to GS and CL. MH was funded by BBSRC Grant to GS and PCW (BB/J016322/1). OJB was funded by a John Lucas Walker studentship awarded by the Department of Pathology, University of Cambridge, and GMF was funded by BBSRC Project Grant BB/M007197/1. 12934_2019_1058_MOESM1_ESM.pdf Additional file 1: Table S1. Escherichia coli strains used or generated in this study. Table S2. Plasmids used or generated in this study. Table S3. Polymerase chain reaction primers used in the study. Fig. S1. Annotation of the genetic region upstream of the flhD operon in E. coli MC1000. Fig. S2. Comparison of growth of the HAP-less and cap-less strains. Growth curve data for the aforementioned strains. Fig. S3. Functional flagellar despite the absence of the FliC D3 domain. SDS-PAGE of secreted protein and motility assay. Fig. S4. The effect of the deletion of clpX from E. coli MC1000. Comparison of the strains by: abundance of secreted flagellin, motility assay and phenotype. Fig. S5. Plasmid maps of (a) pJex-fliC47-empty and (b) pJex-fliC47-cutinase, along with (c) the prototype genetic synthetic modular secretion construct of pJex-fliC47-cutinase. Fig. S6. Comparison of growth of truncated FT3SS secretion strains. Growth curves for all relevant strains. Fig. S7. The FliC secretion signal is required to enable secretion. Immunoblots of secreted and intracellular cutinase. Fig. S8. Comparison of the ‘’late’ FliC and ‘early’ secretion signals. Schematic of secretion constructs and immunoblots of secreted and intracellular cutinase. Fig. S9. Secretion of a range of substrates through the optimised secretion strain. Immunoblots of secreted protein alongside a protein standard.